Posted by Bennett Landman on Saturday, July 30, 2011 in Image Segmentation, Neuroimaging. Segmentation of medical images has become critical to building understanding of biological structure-functional relationships. Atlas registration and label transfer provide a fully-automated approach for deriving segmentations given atlas training data. When multiple atlases are used, statistical label fusion techniques have been shown to dramatically improve segmentation accuracy. However, these techniques have had limited success with complex structures and atlases with varying similarity to the target data. Previous approaches have parameterized raters by a single confusion matrix, so that spatially varying performance for a single rater is neglected. Herein, we reformulate the statistical fusion model to describe raters by regional confusion matrices so that co-registered atlas labels can be fused in an optimal, spatially varying manner, which leads to an improved label fusion estimation with heterogeneous atlases. The advantages of this approach are characterized in a simulation and an empirical whole-brain labeling task. The spatial quality variation exhibited by registered atlases. A representative slice from the true labels (manually drawn) of a target brain is presented in (A). Four example observations of this slice can be seen in (B). The quality of the observations seen in (B) is compared to the true labels seen in (A) to construct the spatial quality variation heat maps presented in (C). 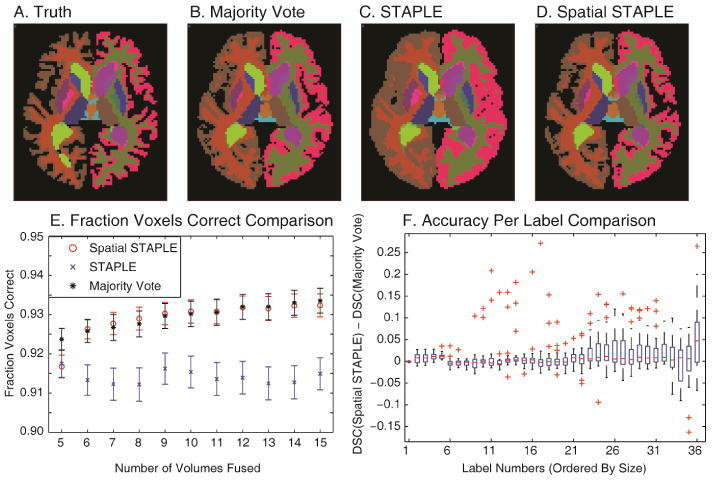 Note that the spatial variation is independent of the actual labels of the brain.